Great news! After our many years of sighing, grumbling, and grousing, the America Online developers finally heard our collective cries. AOL 9.0 gives members their first real weapons to fight junk e-mail. The America Online 9.0 anti-spam arsenal pairs up some old friends (the Address Book, Buddy List, and Mailbox window) with a hefty new recruit — namely the Mail and Spam Controls (keyword Spam Controls) that puts you in charge of your mailbox. The junk-mail counterattack begins in your Address Book and Buddy List. If you never used the AOL Address Book before, start now! Store e-mail addresses for everybody you know and regularly correspond with in the Address Book. Why? Because the new sorting tools treat the Address Book (and your Buddy List) as a master list of people you want to get mail from. With your Address Book armed and ready, turn your attention to your e-mail inbox. There, the AOL 9.0 Show Me Mail From tool organizes your messages based on who sent them, and all with a single click. On the Online Mailbox window, click the Show Me Mail From drop-down list.The software offers five display options, outlined in Table 1. Each message also gets marked with a distinct icon, making scanning messages easy. Mail from people you know earns a plain white envelope icon, bulk mail looks like a package wrapped in brown paper, and messages from everybody else show up as a manila-colored envelope. To make the most of the mail-sorting tools, keep your Address Book entries up to date! Otherwise, you might miss messages that you really want to see when the software accidentally sorts them into the wrong stack. Oops. Now that the old tools are in place and operating smoothly, turn your attention to the AOL Advanced Spam Filter and the other Mail and Spam Controls behind keyword Spam Controls. With this group of goodies, America Online 9.0 definitely kicks the anti-spam battle up a notch. Now, it’s all-out war. The biggest anti-spam tool works automatically, behind the scenes. Your personalized Advanced Spam Filter scrutinizes every single message that comes into your mailbox. If something looks like junk e-mail, the Advanced Spam Filter puts the message into the Spam Folder. Best of all, the filter doesn’t just rely on other people’s judgment — it actually learns what you consider junk e-mail. That’s where the filter’s partner, the Report Spam button (near the bottom of the mailbox window), comes into play. If some junk e-mail finds its way into your mailbox despite all of your precautions, use the message to train America Online 9.0’s custom spam filter. Highlight the message by clicking it once in the mailbox list and then click the happy little Report Spam button. The message immediately disappears from your mailbox, and the Advanced Spam Filter makes some notes about it (including the subject, sender, and other highly technical tidbits). The next time a message like this one arrives, your personalized filter automatically shoves it into the Spam Folder instead of dropping it into your mailbox. To see the messages that the filter didn’t like, click the Spam Folder link in the lower-left corner of the mailbox window. That shifts the mailbox view around a bit, taking you to the Manage Mail tab and the Spam folder therein. Most of the time, you can use the Delete All button to dump all the dead junk mail out of your world. If the filter accidentally sends a good e-mail message here, give the filter another lesson by highlighting the message and clicking the This Is Not Spam button. That moves the message back into your regular mailbox and clears the incorrect filter settings that caused the problem in the first place. You can tighten up things even more with the settings in the Mail and Spam Controls window, shown in Figure 1 (keyword Spam Controls). The settings in here include controls on who you accept mail from, what your spam filter does with blocked mail (send it to the Spam folder or just delete it), and whether or not you want to use the Advanced Spam Filter. You also can banish all messages containing clickable hyperlinks and any messages containing certain words that you list. 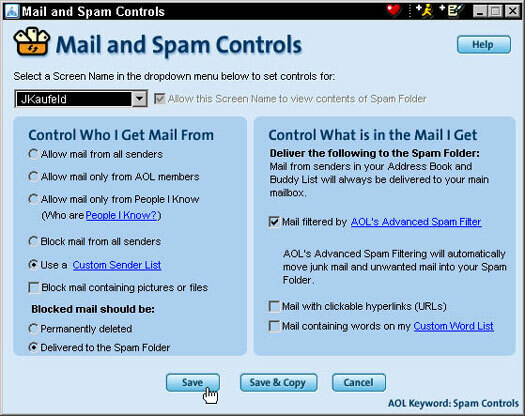 Figure 1: The Mail and Spam Controls window. Focus your spam-fighting efforts on teaching the Advanced Spam Filter its job. The more messages that you kill with the Report Spam button (and save with the This Is Not Spam button), the sharper your filters get. Unless you really, really, really hate junk e-mail and don’t mind deleting a few valid messages as the cost of your crusade, don’t go overboard on the blocking settings in the dialog box. Instead, let the Advanced Spam Filter do its thing.